Looking to buy the Panasonic G80? Get it now for the best price! 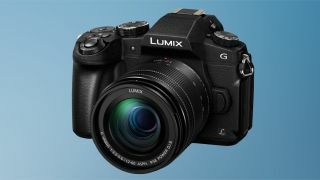 The Panasonic G80 – also sold as the G85, dependent on the market – is a portable mirrorless camera, which succeeds the earlier G7. Not to be confused with the manufacturer’s own GX80, with which it shares a Micro Four Thirds sensor, it displays semi-pro credentials via a splash-resistant and dustproof body that makes use of magnesium alloy. Like its elder siblings we also get 4K and Full HD video capture, the former allowing 8MP stills to be extracted from footage, which means that photographers never need to miss that decisive moment. Similarly useful is the 3in, 1,04million-dot free-angle touchscreen and eye-level OLED viewfinder with a large magnification. The 16MP sensor may not be class-leading in its resolution, but it's but perfectly sufficient nonetheless, while the 49-area AF system incorporates Depth From Defocus (DFD) technology to help focus promptly. Feeling instantly familiar when held in the palm, unlike earlier Panasonic models that only added anti-shake via an image-stabilised lens, the G80 now matches competing Olympus OM-D cameras by incorporating five-axis image stabilisation. Here, it’s stated that this is the equivalent of five extra stops of shutter speed, which is as useful in low light as it is when shooting at longer focal lengths. Enthusiast photographers will be further enticed by focus bracketing and aperture bracketing options, together with an economy mode that allows battery life to be stretched from 320 shots to around 800 to 900 images from a full charge – the kind of performance we’d expect from a DSLR. Added to this, its DSLR-influenced design means that the camera sits more comfortably in the photographer's palm than many of its mirrorless brethren. Creativity arrives in the choice of Photo Styles, including Vivid, Natural, Monochrome and Scenery, plus a raft of individually selectable Creative Control presets, such as High Key, Miniature and Toy effect, plus Rough Monochrome and Impressive Art. Pictures from the G80 are very pleasing straight out of the camera, with well-saturated hues and a great level of detail from a sensor of its size, thanks in part to the lack of an optical anti-aliasing (low-pass) filter. Overall, the G80 is a very credible option for the photo enthusiast, combining big features in a small-ish body, plus results and performance that belie its size (or lack of).